So far I’ve written ten, and am working on one more. Several, oddly, are westerns. Oddly because I had never considered that genre, either as a writer or a reader. For some reason, they seem to roll off my keyboard. Just West of Clovis started this whole writing thing. It debuted in Out of the Storm. Fence Mending – A loner’s gotta be alone. Miss Dashwell’s Odyssey – A journey interrupted. Surviving Idaho – A sort of North western. Willie ‘n’ Me – Love and treachery after the Civil War. Awakening – A contemporary tale. Fatal Harmony – It’s a mystery! NOLA Nights – A 1960’s mystery. No cell phones, no computers. Wow! How did we survive back then? In the SF genre, I have Akron Aftermath. It lives on another site that’s devoted to that sort of shenanigans. Pandora, another mystery, following Ben Cable, Private Detective’s exploits, is finished. I took some time away to let the story come together better while I wasn’t watching. A second Ben Cable story, Missing Georgia, is now under way. Meeting in the Mist – Would you believe romance? Running out of Time – Contemporary Women’s Fiction. The last three may or may not grow up to be stories. Time alone will tell. 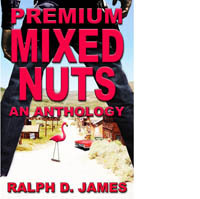 Meanwhile, I’ve corralled the first nine into an anthology, Premium Mixed Nuts. It’s available on Amazon and several other venues!